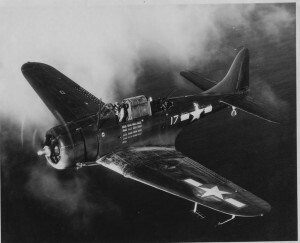 At 3:00 p.m. on January 12, 1943, two U.S. Navy SBD-4 Dauntless aircraft were returning to Quonset Point Naval Air Station after a patrol/photographic flight when they encountered snow squalls over the Providence metropolitan area and were forced to make emergency landings. One aircraft (Bu. No. 06925) attempted to land in a field near St. Mary’s Seminary on Pawtucket Avenue in East Providence, and in the process collided with a tree and flipped over. The pilot, Ensign John Robert Jasper, 22, of St. Louis, Missouri, was killed, and his companion, Photographer 3C, Ollen Amay Stevens, 26, of Detroit, Michigan, was seriously injured. St. Mary’s Seminary is today known as St. Mary’s Bay View Academy located at 3070 Pawtucket Avenue. The second aircraft made a hard landing in another field about a quarter of a mile away. The pilot, Ensign William E. McCarthy, 23, of Mansfield, Mass., and his companion, Seaman Apprentice Edward Goumond, 20, of Johnston, R.I., were slightly injured. Ensign Jasper had just celebrated his 22nd birthday twelve days earlier on December 30th. His body was brought to Quonset Naval Air Station In North Kingstown, Rhode Island in preparation for burial. He’s buried in Resurrection Cemetery in Afton, Missouri. To see a picture of his grave go to www.findagrave.com and see Memorial # 47782542.